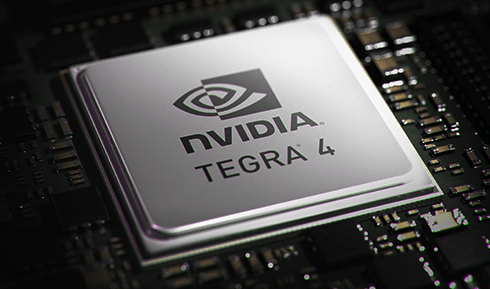 On Sunday at the International Consumer Electronics Show, Nvidia debuted its next generation chip, the Tegra 4. The new silicon contains six times more graphics cores and uses a more advanced architecture than its predecessor. Tegra 4’s introduction wasn’t unexpected, but Shield, an Android game console built around the Tegra 4 surprised. First there’s the new chip, which will power smartphones and tablets as well as Shield. Nvidia(s nvda) combined 72 graphics cores with a quad-core Cortex A-15(s armh) chip, which it claims offers a 2.6 times performance boost for browsing the web on mobile devices. Those graphics cores come in handy for photography too: Every photo capture can be done in HDR, or High Dynamic Range imaging; something that Nvidia says takes 2 seconds on an iPhone 5(s aapl) today takes 0.2 seconds on a Tegra 4 device. An optional 4G LTE software-defined modem chip, the i500, can also be paired with the chip. This puts Nividia in with Qualcomm (s qcom) offering an integrated Radio and application processor for mobile devices and takes advantage of its Icera purchase. Now about that gaming device. Shield is slightly larger than and looks similar to an Microsoft Xbox 360(s msft) game controller. There’s one key difference however: Shield is a standalone gaming device that provides console-gaming quality. 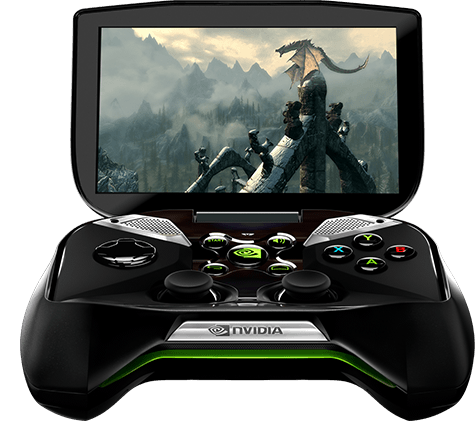 Nvidia’s Tegra 4 is at the heart of Shield and its 5-inch 720p integrated touchscreen display. Games from Nvidia’s TegraZone are supported as are streamed video games on the Steam platform. The handheld has bass reflex speakers and 802.11n (Wi-Fi) connectivity. Shield runs on pure Google Android (s goog) and in addition to games, can be used for viewing media, checking in on Facebook (s fb) and more. Shield will run for 5-10 hours for gaming and just over 20 hours to view high-definition video. You’re not limited to the small screen, however. With an integrated HDMI port, Shield can output all content to an HDTV screen; wireless video streaming is in the works. The device can play streaming games from a supported computer.